Dorisjane Herwynn Casey, 99, of Reinbeck, Iowa, passed away on Saturday, October 20, 2018 at the Parkview Manor in Reinbeck, Iowa. Visitation will be held from 5:00 p.m. until 8:00 p.m. on Friday, October 26, 2018 at the French-Hand Funeral Home in Reinbeck. A funeral service will be held at 10:30 a.m. on Saturday, October 27, 2018 at the Union Congregation United Church of Christ in Reinbeck. Burial will follow at the Reinbeck Cemetery. Doris was born on June 18, 1919, in McPherson, Kansas, to her parents Charles H. & Doretta (Harms) Sandy. She was raised in McPherson and graduated from McPherson High School in the class of 1937. She was united in marriage to her husband John Perry Casey on November 12, 1939 at the Congregational Church in McPherson; together they welcomed three children into their family. John built concrete grain elevators and the family moved from jobsite to jobsite in Iowa, Nebraska, Kansas, Oklahoma and Texas; settling in Reinbeck in 1966. Doris worked as the bookkeeper for her husband’s construction company, as a choir director at various churches, and at Parkview Manor as the night charge aide and activity coordinator. 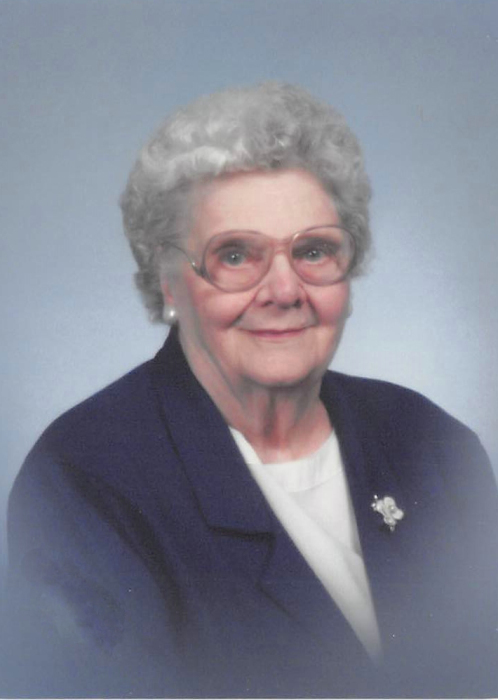 Doris was a long-time member of the First Baptist Church in Reinbeck. There she served the church in a variety of roles. Doris served as a volunteer for the Hawkeye Valley Area Agency on Aging (NEI3A). As Doris aged, she continued to serve; going so far as having the Medicare Fraud Hotline installed directly into her home so that she could continue to answer calls. Doris was actively involved in the Meals on Wheels Program, the Council on Aging, and the Reinbeck Friendly Seniors. Doris was honored by the State of Iowa and the United States government for her years of volunteer work. Doris enjoyed doing cross stitch, crafts, and loved making homemade cards for her family and friends. Doris was very creative and loved using that creativity to brighten someone’s day and make them feel special. Her true joy in life came from being a devoted wife and mother to her family and serving God. Doris is survived by her daughters, Jane Rau of Summit, New Jersey; Teresa (John) Parmenter of Orlando, Florida; granddaughter Sandy Jane (Shannon) Morlang of Canton, Missouri; grandson John Henry Parmenter Jr. of Orlando, Florida; great-grandchildren George, Amanda Jane, Audralynn, and Tiger; daughter-in-law Rebecca Casey, and many nieces and nephews. She was preceded in death by her parents; husband John Perry Casey Sr.; son John Perry Casey Jr., grandson George Parmenter; sister Marilynn Voth; brother Charles Herbert Sandy Jr.; and son-in-law David Rau.